Welcome to the Calhoun County Supervisor of Elections Website! If you want to register to vote or would like to change your party affiliation you must do so before book closing deadline. 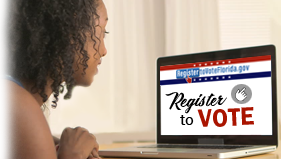 You may click on Register to Vote to register or update. Once registration books close, only updates to a voter’s name, address and signatures shall be permitted. Sat – Sun (8AM – 4PM) @ Supervisor of Elections Office. ELECTION DAY: June 18, 2019 (7AM – 7PM) Voters will vote at their precinct. Voters who voted at the Altha Community Center will be voting at the New Altha Gym; Voters who voted at the Kinard Library will be voting at the Kinard Library (portable building) behind the library. Our goal for this site is to answer commonly asked questions and keep the citizens of Calhoun County well informed. If you have any comments or suggestions for improvements, please let us know. We want to hear from you. You have up until 29 days before the next election to change your political party. It's never too early to update your address for the next election. If you have moved into Calhoun County or have moved to another address please let us know. It's as simple as calling our office and giving us the information over the telephone.